AbsolutePoker.com is a star in the online poker industry. To remain competitive, they must attract new players and retain existing players. The company was looking for a way to offer creative promotional products as reward prizes and special offers to increase loyalty and build brand recognition. These samples proved to the company how effective and impressive promotional marketing can be. Proforma's creativity, due-diligence and hard work paid off for AbsolutePoker.com during the company's marketing promotion at the 'main event' for World Series of Poker. Due to the success of the promotional products, AbsolutePoker.com is considering the launch of an official online store and the creation of a custom AbsolutePoker.com Chip Case to be sold online and in retail outlets. AbsolutePoker.com is now positioning themselves as leaders in the online gambling industry. Proforma assistance with promotional marketing has helped 'stack the deck' in their favor. In appreciation, AbsolutePoker.com named Proforma their Supplier of the Year. 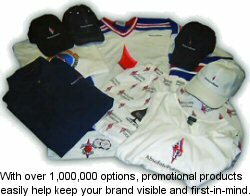 If you are looking to launch an effective, creative promotional products campaign to increase brand recognition, contact us today.